Katy Haldiman is a uniquely well-rounded expert on nutrition and healthcare. 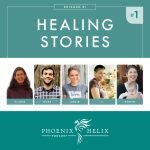 She has a bachelor's degree in nursing, a master's degree in healthcare administration, co-owns an athletic training center, and is currently pursuing a holistic nutritional therapy certification. In addition, she has two autoimmune diseases which she has dramatically healed through diet and lifestyle. She shares her story with us today. In retrospect, my first symptoms of autoimmune disease occurred in my early teenage years. I was about 14 years old when I started having some mild joint pain and swelling in my fingers. My parents took me to the physician and he ran some various tests to rule out different types of arthritis. Everything was negative at that time and I was told not to worry about it. I continued to have mild joint pain and swelling on and off for several years, as well as other vague symptoms that no one thought to piece together. I had frequent headaches that eventually led to debilitating migraines. Bladder problems kept me running to the bathroom constantly, although doctors could find nothing wrong. I had severe acid reflux that was unresponsive to medications. The doctors could not explain the cause of my fatigue and muscle aches. I had frequent ovarian cysts and suffered horrible menstrual pain. It seemed as though I was always catching colds and infections. For a young, “healthy” person, I certainly had a lot of health concerns. I now believe that all of these vague symptoms and conditions were connected. In 2010, I began having abdominal bloating, gas, and a change in my bowel movements, and by 2012, my symptoms worsened to the point that I was quite ill. Eventually, I was diagnosed with Crohn’s disease in July 2012. 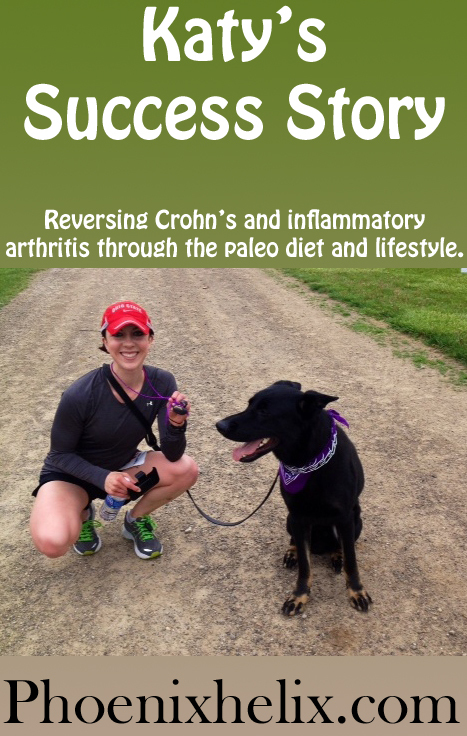 A few months later, I was diagnosed with seronegative inflammatory arthritis. It was a dark and frightening period in my life. I’ve always been an athlete, but yet I had turned into someone that struggled to get out of bed and function normally. I was ill enough to be concerned about how I was going to continue working full-time. I had frequent and severe diarrhea that made it necessary to be near the bathroom at all times. I was afraid to leave my house, because I never knew when I was going to have an episode. At the worst, I was having diarrhea 10-15 times per day. In addition, I felt ill, as though I had a bad case of the flu every single day. I had fatigue that I can only describe as an exhaustion that I felt “down to the bone”. Everything hurt, but especially my joints. I had trouble getting up, walking, and holding onto things because the joints in my toes, fingers, hands, and wrists were affected. I was depressed and worried about how much worse my health could get. Before discovering the paleo lifestyle, I was on 13 different prescription medications. 6 were for GI-related symptoms, 3 for inflammatory arthritis, 2 for anxiety, 1 for migraines, and 1 for acne. The ones for Crohn's seemed to make the GI symptoms worse (greater inflammation, nausea and loss of appetite, which concerned me because I had already lost too much weight.) The ones for arthritis helped my pain, but they exacerbated my acid reflux issues, and I found their long list of potential side effects frightening. Which healing diet(s) did you choose? Can you describe your process? When the GI specialist told me that I have Crohn’s disease, one of the first questions that I asked was what diet I should be following. Her reply was, “It doesn’t matter, eat whatever you want. Diet has no impact on Crohn’s.” And that was that. Even if I had no background in health care and no prior interest in the field of nutrition, this advice wasn’t logical. How could it possibly be that an immune system disease that manifests in the GI system, which is known to harbor approximately 70% of the body’s immune system cells, not be impacted by the food that you eat? Prior to my diagnosis, I had been a vegetarian for 3 years, so the first change I made was to switch to a gluten-free diet with animal protein added back in. This did not seem to help my symptoms at all. Internet research led me first to the Specific Carbohydrate Diet (SCD), then the Gut and Pyschology Syndrome Diet (GAPS), then the Paleo Diet, including the Paleo Autoimmune Protocol (AIP). You can read more about each of these healing diets here. When I started the SCD diet in August 2012, I noticed an improvement in bloating and gas within 24 hours. My other GI symptoms initially got worse (which I now believe was a detox/healing reaction), but then gradually improved until they resolved completely after 6 weeks. It took longer to see improvements in the joint pain and fatigue. I switched from SCD to GAPS, which accelerated my healing. Then I did a month of the Paleo Autoimmune Protocol and through the challenge/reintroduction phase, I learned that I'm intolerant to nightshades, eggs and dairy. I removed those from my diet, and after 5 months on this customized version of GAPS/Paleo, my joint pain improved dramatically. Under my doctor's supervision, I was able to slowly eliminate all 13 of my original prescription medications. Are you on any over-the-counter or prescription medication now? The only medication I take now is low dose naltrexone (LDN). LDN is an alternative therapy that is used in the treatment of a wide variety of autoimmune diseases. It is the least toxic medication that I’m aware of, and that includes any over-the-counter medication. LDN is believed to work by briefly blocking the opioid receptors in the brain, which leads the body to increase endorphin production. Endorphins are thought to play a central role in regulating the immune system. LDN is a very safe medication, with virtually no side effects beyond difficulty sleeping in the first few weeks of use. Although I do feel that LDN has helped to speed the healing process, I do not believe that it is a “magic bullet” by any means. Without the foundational diet changes, I don’t believe that LDN would be nearly as effective. The bitter cold of the Midwest winter and the ever-changing weather of this region does sometimes affect my joints, but it is mild and I do not require the use of any pain killers. When I do experience joint pain, it is in fewer joints than before, and it doesn't limit my activity at all. Better still, there are days that I have no pain at all, and recently, pain-free days are outnumbering the others. All of the symptoms that I’ve struggled with for years have resolved. I no longer have migraines, acid reflux, bladder problems, ovarian cysts, menstrual issues, fatigue, or muscle aches. And I survived an entire cold and flu season without getting sick! My seasonal allergies have also seemed to disappear. My mood has improved and I’m feeling great overall. None- I truly believe that nutrition is the foundation of health. I lift weights, walk, swim, bike, do yoga and incorporate high intensity interval training into my workouts. 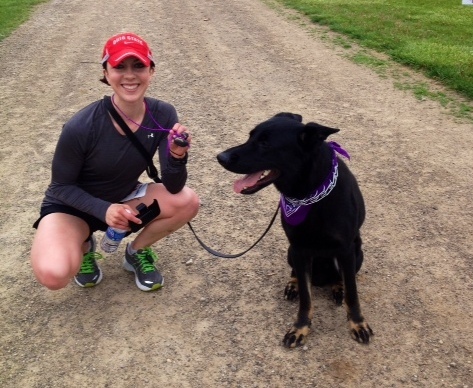 I used to be an endurance athlete, but unfortunately, frequent endurance exercise is not the healthiest choice for those with autoimmune disease. I am a strong believer in the power of meditation and prayer, and I practice this daily. Certain supplements and herbs that support healing, as well as massage is a part of my regimen as well. In the past, I used acupuncture to assist in the healing process and I found it quite helpful. I have been very strict with following my customized version of the paleo diet. I do not allow myself any cheats. Paleo is a lifestyle for me and I intend to follow it for the rest of my life. Eventually, I would like to get to the point where I can add some raw cheese into my diet. The inclusion of raw dairy into the diet is considered more primal than paleo, but I will see how my body handles it and go from there. I think that I still have some healing to achieve before I attempt it though. When first following the diet, my biggest challenge had to do with time management. Cooking and preparing all meals from scratch does take time. Once I figured out how to prep for meals and do some meal planning, it became easier. Another challenge is the social aspect of following the paleo diet. Business lunches and engagements, holidays, family gatherings, and spending time with friends often involve food and dining out, which can be difficult to navigate. However, I’ve found that it’s important to find a balance and not avoid social gatherings completely. I often explain my dietary preferences to the host and ask if I can bring a dish to pass. Although I usually prefer to avoid restaurants, I have learned which restaurants tend to be “safer” than others and how to order to make sure that I don’t become ill. I travel quite a bit for my work and that can also be a challenge. The electric skillet is one of the greatest inventions ever! I wondered if you'd talk a bit about being a paleo nurse. Do you feel that it informs your work, or is it a conflict with conventional medical philosophy? In my full-time job, I work as a health care surveyor for the government to evaluate the quality of care that is provided across different types of health care settings. I do enjoy this line of work, and because I am not providing direct patient care in this role, there is relatively little conflict between my health and nutrition philosophy and the work itself. As far as working in a direct patient care role in the conventional health care system, it is not something that I would ever be able to go back to. My health and nutrition philosophy is simply too different from the expectations and standards of conventional health care. That is why I'm pursuing my nutritional therapy certification. 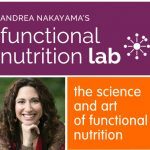 My hope is to eventually make holistic nutrition and lifestyle counseling a larger focus of my career. My entire family has been extremely supportive in my healing journey. A few months ago, my mother started following the paleo diet herself and my father is slowly moving in that direction as well. My significant other has also been there for me through all the ups and downs. Without his compassion, understanding, and emotional support, I wouldn’t be where I’m at today. In order for a dietary protocol to help with autoimmune symptoms, I believe that you must commit to follow it 100% strictly. Although some minor improvements may be noticeable within 30 days, to allow significant healing to occur, I recommend giving it no less than 3 – 6 months before deciding if it is really helping you or not. Be prepared that some symptoms may become worse before they become better and that is often a normal healing reaction. Keep an open mind, a positive attitude, and don’t give up! As a society, we have been conditioned by the pharmaceutical industry and the conventional “sick” care system to believe that natural treatments, including the consumption of a real food diet, are not to be trusted or taken seriously. However, do not let anyone talk you out of trying dietary changes. Conventional health care providers are not trained to understand the importance of nutrition to overall health. Nonetheless, there is a small, but growing body of evidence that supports the link between nutrition, the gut, and disease. Although it’s easy to think of paleo as a restrictive diet if you only focus on the things you are giving up (grains, legumes, dairy, soy, processed sugar, hydrogenated oils, preservatives, additives, etc. ), try to focus on what you will be gaining. To me, paleo represents freedom. Freedom from medications with toxic side effects, freedom from frequent and frustrating doctor appointments, and freedom from being sick, sad, and scared of the future. It has allowed me to gain my health and life back, and I am so grateful for that. 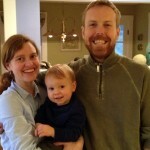 You can follow Katy's journey on her blog: The Paleo Nurse. Update: Katy has completed her nutrition training and is now seeing clients.